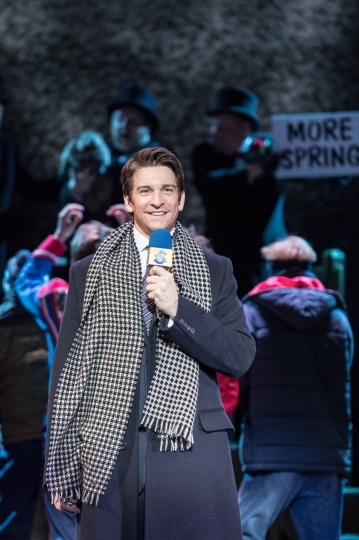 LONDON — "Groundhog Day" is back, this time on stage. Is it deja vu, or something new? 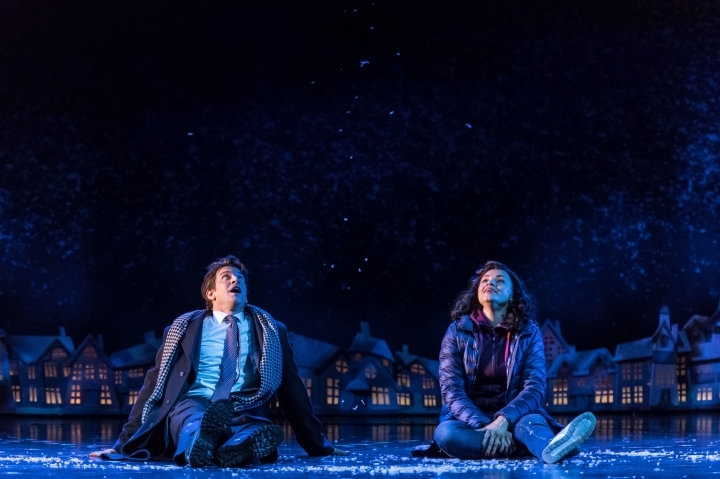 A musical based on the much-loved 1993 movie about a jaded weatherman forced to live the same day over and over has opened at London's Old Vic Theatre at the start of what producers hope will be a journey to Broadway. Britain's theater critics were largely enthusiastic Wednesday, the day after the show's gala premiere, praising its zany fun and dynamic theatricality, and hailing star Andy Karl as a worthy successor to the movie's leading man, Bill Murray. Ann Treneman in The Times of London said the show "manages to couple laugh-out-loud British humor with American razzmatazz." The Guardian's Michael Billington found it "fantastically smart, clever and witty," though he said "it left my heart untouched." Dominic Cavendish in the Daily Telegraph called the show "an instant classic ... equal to, and perhaps better than, the movie." The musical's script is by Danny Rubin, who co-wrote the film and keeps it faithful to the spirit of the original. Composer-lyricist Tim Minchin and director Matthew Warchus are the team behind "Matilda The Musical," the Roald Dahl-inspired show that won seven Olivier Awards and four Tonys. Like "Matilda," it's a bold, clever mix of cynicism and optimism, both tart and tender. Pittsburgh weatherman Phil Connors (Karl) is less than thrilled to be spending Feb. 2 in small-town Punxsutawney, Pennsylvania, covering its famous weather-forecasting rodent — or, as Phil puts it, "talking to hicks about magical beavers." First he is trapped by a blizzard, then by some sort of karmic revenge: He wakes every morning to find that it is, once again, Groundhog Day. Phil's shock gives way first to hedonism and then to despair, as he realizes he is essentially immortal. One disturbing number shows his many and varied attempts to kill himself — gun, knife, toaster in the shower. After each death he awakes as though nothing has happened. But while it flirts with the abyss, the show is often funny, and ultimately redemptive. Phil emerges transformed, like Scrooge in "A Christmas Carol" — in this case by being shown the ghost of eternal present. Karl, who was Tony-nominated for the short-lived New York stage version of "Rocky," gives an underlying boyish charm to a character who is basically a monumental jerk. The rest of the characters are little more than sketches, although Rita, Phil's producer and reluctant love interest (played by Carlyss Peer), gets solo numbers that give her some depth. The show didn't draw unanimous praise. The first half is hectic — and repetitive, though that comes with the territory. The songs, an eclectic blend of rock, country and other influences, are not as immediately catchy as some of the numbers in "Matilda." Quentin Letts in the Daily Mail said the musical "needs more work" and more heart. The Hollywood Reporter's Stephen Dalton said Karl "struggles to earn audience sympathy" as Phil, though he found the staging by Warchus — working with choreographer Peter Darling and designer Rob Howell — "very inventive, and hugely charming." "Groundhog Day" runs at the Old Vic until Sept. 17 and was initially due to open on Broadway next year. But co-producer Scott Rudin pulled out of the project in June, leaving its New York future uncertain. The enthusiastic reviews — not least by the New York Times' influential critic Ben Brantley — should help ensure its future.